The legendary John Hannah was instrumental in establishing the School of Education in 1952. Throughout his tenure as president, he would support the development of the school and push for efforts to provide quality teachers for Michigan's schools. Photo courtesy MSU Archive. As instrumental as John Hannah was to the formation of the School of Education, it was a group of deans that prepared the formal report and recommendation. Of these deans, the most influential was L. C. Emmons, who was dean of the School of Science and Arts. Emmons had long had education under his administrative responsibilities, and throughout his tenure had made plain his view of how important he considered teacher preparation. In the early 1940s he had strongly supported the establishment of an elementary education program. The report recommending the establishment of the school moved quickly through the approval process, and there was a great deal of discussion among the faculty as to who would be appointed dean of the fledgling institution. Interestingly, Clifford E. Erickson was not the first choice. This is surprising given that Erickson was a rising star from virtually his first day on campus. In fact, it was a twist of fate that made it possible for Erickson to assume the deanship of the School of Education. The first dean of the school was Lee M. Thurston, who at the time of his appointment was Michigan superintendent of public instruction. Because Thurston was beginning his third two-year term as superintendent, he requested and received permission to delay his appointment for a year. So for the first year of the school’s existence, Cecil Millard, who had taken over for Noll in 1943 as head of the Division of Education, served as acting dean. Thurston, however, would never take the job. In June 1953, Thurston asked the Board of Agriculture to release him of his commitment in order to become commissioner of education at the U.S. Department of Health, Education and Welfare. The board agreed and then promptly chose Erickson, who had been serving as dean of the Basic College, to take the helm of the school. It would be up to Erickson, the former teacher, counselor and principal, to lead the school through its formative years. Possibly the most influential dean in the history of the College of Education, Clifford Erickson began his professional life as a teacher. Photo courtesy MSU Archives. “There is no question in my mind that Clifford Erickson is the most important figure in the history of the College of Education,” said Professor Emeritus Walter Johnson, who was hired by Erickson to join the Institute of Counseling, Testing and Guidance in 1948. “He had tremendous energy and ideas. He was a great man. To fully understand Erickson’s influence is to first appreciate the importance of establishing education as its own school. Throughout most of the first four decades of the 20th Century, education had been little more than a department—one of a number of others—tucked within a division or school, answerable to a dean whose responsibilities extended well beyond education. Becoming its own school conferred to education prestige and presence on campus. More importantly, education could now control its own budget, and its dean had substantial power to set direction, make changes in organizational structure, launch initiatives, and deal with other deans on campus as an equal. In many ways, becoming its own school allowed education to control its own destiny. Erickson, it turned out, was well positioned to play the institutional game. As head of the Institute of Counseling, Testing and Guidance, he had developed a large and prosperous graduate program and had found a way to gain an unusual degree of autonomy in the process. He had also built a strong relationship with Hannah, who selected him to become dean of the Basic College, the ahead-of-its-time general education program for undergraduates, only a year before the School of Education was established. By the time he assumed leadership of the School of Education, Erickson was a savvy university administrator. He would not be shy in using his power to shape the School of Education. It was in Erickson’s nature both to reach out to faculty and to take command when the occasion called for it, remembered Charles Blackman, who joined the faculty in 1956 and would serve the college in various roles for more than 30 years. “He was a man who sought ideas from other people,” Blackman said. “Although I remember in one case where he gathered all of us in the department in the basement of old Wells Hall, which was where the large conference room was located, and he said he was really looking for ideas, and he said that anything was valid. “One of the first suggestions was ‘Should we consider having a laboratory school?’ His immediate retort was ‘We will never have a laboratory school at Michigan State University.’ For all practical purposes, that ended the conversation. It was a philosophical issue for Erickson, of course. He thought we ought to be directly involved in the public schools and a lab school was not part of the equation. In 1953, the committee issued a lengthy report calling for restructuring of the School of Education, much of which Erickson implemented. The school went from seven departments to five. The Department of Educational Foundations had programs in curriculum and methods, evaluation, measurement and statistics, and growth and development. The Department of Teacher Education was home to programs in elementary, secondary and higher education. The Department of Educational and Administrative Services had programs in administration and supervision, guidance and counseling, and outdoor and recreation education. The Department of Vocational Education became the repository of some of the earliest programs in education, including agricultural education, home economics, and industrial arts. Other than a slight revision in its title to the Department of Health, Physical Education and Recreation, that department continued almost unchanged with its various programs. Interestingly, the program was home to intercollegiate athletics and the department chair was Clarence “Biggie” Munn. In 1953, the Department of Physical Education, Health and Recreation became part of the College of Education. The department was home to intercollegiate athletics, and that season Clarence "Biggie" Munn led the Spartan football team to the Big 10 championship and a Rose Bowl victory. Mum would become head of the department of the following year and remain its chair until 1971. Photo courtesy MSU Archive. For Noll, the changes in the curriculum may well have been Erickson’s most influential move. Another important emphasis that Erickson made clear from the start was a commitment to practice and practitioners. He wanted faculty members to be out in the schools, working with teachers and administrators and others, using their expertise to help solve problems and improve practice. For Erickson (as it was for Hannah), the mission to serve—be it the state, nation or world—somehow almost went beyond the land-grant tradition to a kind of moral imperative. A commitment to service and outreach permeated much of what Erickson did, and the kind of faculty he recruited. In fact, it was exactly the kind of thing Erickson wanted to hear. A large percentage of the faculty was made up of former teachers and administrators. Under Erickson’s leadership, the new college quickly established itself as an institution actively engaged with schools and educators. Throughout the 1950s, the college's teacher preparation programs in elementary and secondary education grew steadily. Assigning student teachers to area schools and mentor teachers was by then already an important component of the program. Photo courtesy MSU Archive. would evolve into a particularly strong program under the leadership of men like Howard Hickey and others. There quickly emerged among the faculty a loyalty to the new school. Betty Rusk had first met Erickson when he was dean of the Basic College in the early 1950s, and she was hired to teach a course in communication skills. Not long after the new school was established, she joined the faculty to teach the secondary methods course in English. “Dave Mead, who for years was head of the English Department, came over to my office and asked if I would teach the secondary methods course,” recalled Rusk, a former high school English teacher who would go on to coordinate all of the college’s secondary methods courses. “At that time, the English Department was in charge of it. Then he told me he wanted me to leave the college and join the English Department. “I told him, ‘Dave I’d like to do it, but I want to stay in education. I want a dual appointment.’ I don’t think I even knew exactly what that meant, but I didn’t want to leave education. He said that was fine with him and he went back and worked it out. Erickson believed strong in the benefits of faculty interaction, especially across disciplinary boundaries. 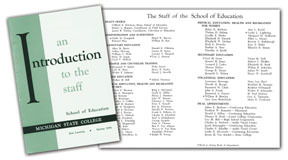 Above, the first faculty brochure was produced in 1954 and used as much to reach out to educators as to spur interaction among the quickly expanding faculty. Courtesy MSU Archive. Starting in 1937, the main offices of the department were in Morrill Hall, which had been a women’s dormitory. As the department grew, faculty spilled into old Wells Hall, which had also started out as a dormitory. “I shared an office at Wells Hall that had been a shower,” Blackman recalled. “It still had the tiles and all that.” Prior to 1940, Department of Health, Physical Education and Recreation faculty members were housed in the what is now known as the IM Sports Circle. In 1940, faculty assigned to the programs for men and women were moved to Jenison Gymnasium and Fieldhouse. 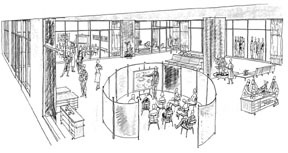 With the faculty scattered throughout the campus, there was consensus to build a facility for education by the time the School of Education was established. The work on the building didn’t get underway in great measure, however, until Erickson took control in 1953. Plans were completed by 1955 and the university broke ground in 1956 on a five-story building on the corner of Shaw and Farm lanes along the south bank of the Red Cedar. The building was developed with substantial input from the faculty. Erickson appointed Fuzak as liaison between the college, the construction company, and the architect. Other faculty members were involved determining how office space was to be laid out. A unique idea in the original architectural plans was the kiva, a round dome and glass hall in the front of the building. It was then—as it is today—one of the building’s most distinctive features. One of the most important developments during the 1950s was the construction of what would later be known as Erickson Hall. Much planning went into the interior design of the state-of-the-art building. Photo courtesy MSU Archive. As construction was underway, the faculty began discussions about how to use the space. Both Blackman and Fuzak remembered many suggestions, and much give and take in ways to organize the offices. Erickson, Blackman recalled, wanted faculty to interact, especially across programs. All sorts of suggestions were offered, including assigning offices by alphabetical order or at random. “There was a lot of serious discussion about how to open the building up, and the third and fourth floors were designed intentionally with the idea of fostering interaction and communication,” Blackman said. The faculty agreed to situate the secretaries in the center hallway of the third and fourth floors. 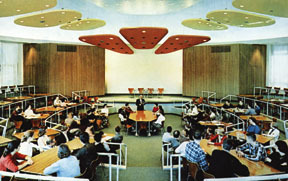 The rooms on the north and south of the center hallways became faculty offices, and the various bays outside the offices were turned into meeting areas with large conference tables. Faculty members were grouped by interest areas. The building was finished in 1958 at a cost of $4 million. Among some of its features were 14 classrooms with capacities from 35 to 70, and the kiva as the large lecture hall. Noll wrote that the building also housed a laboratory “for observation and demonstration purposes consisting of one large classroom surrounded by seven smaller rooms, with low-density one-way glass partitions between them useful for testing and for clinical demonstrations and practice.” The south wing of the first floor was Fuzak’s domain because it included the Industrial Arts Shop. The building was also wired for closed-circuit television. The new facility was named the College of Education Building. (Interestingly, Noll found that a group called the Michigan Agricultural Conference urged the Board of Agricultural to name the new building the Walter H. French Education Center. The board, however, never took any action on the request.) Completion of the building marked a symbolic moment in the development of the college. In less than a decade of existence, the college had established a new organizational structure, revised the teacher preparation curriculum, and built a home base for faculty and students. As the 1950s drew to a close, Erickson’s energy and leadership had clearly pushed the college forward, establishing its presence on campus both intellectually and physically. In the 1960s, Erickson would leave the college, and the faculty would embark on decades-long experimentation and innovation in the way teachers were prepared for the classroom. The Erickson Hall kiva was one of the most unique features of the new building. The picture above is of the interior of the kiva and was part of a series of postcards created by MSU in the 1950s. Photo courtesy of Robert Floden.